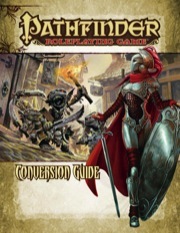 This guide is intended to make converting your 3.5 game to the Pathfinder Roleplaying Game quick and easy. It includes rules for converting characters, monsters, feats, spells, prestige classes, and magic items from the 3.5 version of the rules to the Pathfinder Roleplaying Game. To use this conversion guide, you will need a copy of the Pathfinder Roleplaying Game Core Rulebook, as page numbers and tables referenced throughout this conversion guide refer directly to that book. While the Pathfinder Roleplaying Game Bestiary (due out in September, 2009) is useful in converting monsters, the guidelines in this document will suffice until its release. The first half of this document addresses how to convert characters, covering everything from ability scores to experience points. This step-by-step process is primarily for adjustments to player characters, but a quick version is presented later for making changes to minor NPCs and villains. The second half of this document deals with converting existing mechanics, including prestige classes, feats, spells, and magic items. While this guide tackles a wide variety of issues, Game Masters should expect to adjudicate a number of minor issues that fall outside this scope. For anyone who is new or hesitant of playing Pathfinder because they know the 3.5 rule set too well and don't want to learn a new rule set. I recommend this to review and find out it's really not hard to learn. It's simple and fun. Give this product a read and you won't be upset. First of all, I am new to Pathfinder, but have been playing 3.5 (mostly FR, since it came out). I was exited when a buddy of mine told me that Pathfinder had picked up the mantle of 3.5 gaming and was going to run with it. I didn't know anyone had and was affraid 3.5 would die out. This was the first thing I downloaded from the site and after reading it, wow, I am very exited about seeing whatelse they have. This pdf convinced me that Pathfinder is going to take 3.5 in a good direction. I cant wait to read the core rule book. Does this convert to the Beta Playtest rules or to the newly released Core Rulebook rules? Anything anywhere to convert PF Beta to Core? I'm running Beta and I don't want to yank stuff out from under my players by switching to Core. BTW, I did purchase the Core Rules. Not that I am aware of. I would just use the 3.5 to pfrpg as a roadmap, making sure you go over any feats and such and you should be fine. I never had to convert from beta to pfrpg though as I only GM the pfrpg. My players had very little problems converting from beta to the final rules, with the exception of some feats I allowed them to switch out as they didn't make much sense under the final rules. do i need to convert the pathfinder scenarii that came out before the core rule book? Nope! Other than calculating CMD and CMB on the fly when necessary, you should be able to run the scenarios as written. There are a few threads on the Society messageboards where people are discussing this. I'd love to be able to sanp this up as a physical product. How can I get a copy of this PDF??? Click on the add to cart or downloads, I'm not sure, it's already in my downloads. I've found this handy little pdf great for getting my 3.5 friends to give PFRPG a shot. It's a good outline of some of the changes from 3.5. This has been very useful for me, as well as my friends, to bring our characters over to pathfinder and continue playing. well i cannot download this yet, but, its dont really hard to convert a few things. where the problems comes, is in the other classes, like warlock, hexblade from the phbII and all other classes from the complete compendiums, i dont miss the pleaase,and i hope never release a book with them, they has a really use in the real game? Hi want to look at these rules bu i cannot get the bloddy thing to download. evertime i click on it in on th my downlaods page it sends me here. Check your downloads. I've had something like this happen to me in the past. Click to download and taken to the product discussion but it was added to my downloads. I had to go there to download it. it sounds like you're clicking on the product name (which takes you to the product page). Click on the "Personalize" button to the right of the product name to begin downloading. So you are not happy with this Free product that is intended to help you convert a 3.5 character to Pathfinder, because it doesn't help you convert a different game system to Pathfinder????? Just because you failed to comprehend the purpose of this document does not make it a bad product. Does a conversion guide from D&D 5e to Pathfinder exists? is that a thing? No there isn't. Converting something from 5E to Pathfinder should be extremely easy, in fact, because there are a ton more options to create the kind of character you want than there is in 5E, which has extrmeely skimpy material (unless you go 3rd party, but even still, the mechanics allow for skimpy goodies for a 5E character since everything can fit on on sheet of paper). It is not a thing that we have produced. Just out of curiousity, what about converting ships or other vehicles? since there seems to be difference, when you look at the ship description in Pathfinder and in a book like Stormwrack.